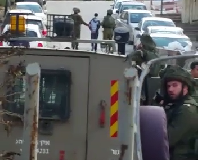 On Sunday, soldiers arrested Ariadna Jove Marti of Spain and Bridgette Chappell of Australia at the Ramallah office. The High Court of Justice ordered the two women freed on Monday. Yesterday’s raid took place at 3 A.M. Hours later, the ISM held a press conference, in conjunction with other pro-Palestinian organizations, at which they lashed out at the IDF’s behavior. According to the ISM, the army launched an organized campaign in mid-December, the goal of which was to break up the popular protests against the separation fence in the West Bank villages of Bili’in and Na’alin. This campaign has included arrests and other forms of harassment, the activists charged. Chappell said the IDF apparently sees the ISM as a “challenge” to Israel, and is therefore taking action against it. She added that the army would not find anything incriminating in the group’s computers, as all its activities are strictly legal. 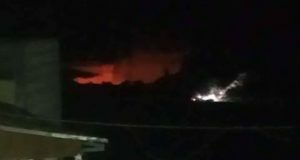 According to the Israeli organization Anarchists Against the Wall, the IDF has conducted no fewer than 18 nighttime raids in Na’alin alone since December, during which time it has arrested 25 people. Bili’in was subject to five raids and eight arrests. 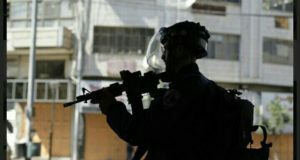 “I don’t think there were even that many army raids in Nablus in 2002, at the height of the intifada,” claimed Jonathan Pollack of the anarchist group. In addition to its two raids on the ISM office, the IDF also raided the offices of two other groups – Stop the Wall and the Palestinian Communist Party – this week. The activists claim that none of these groups are involved in terrorist activities; they merely organize demonstrations. ISM, founded soon after the second intifada began in September 2000, is a very small group. It usually has less than 20 activists in the West Bank at any one time. Nevertheless, it has been heavily involved in anti-Israel protests, and is currently active in the demonstrations against house demolitions in East Jerusalem as well as the protests in Bili’in and Na’alin. It also has four activists located in the Gaza Strip. Two ISM activists have been killed while protesting, Rachel Corrie in 2003 and Tom Hurndall in 2004; two others have been seriously wounded.